Japan has a long history of whaling. Half a dozen towns can trace their whaling history back hundreds of years, to when whales were driven into nets, harpooned repeatedly and then dispatched with either a long sword or a wooden plug driven into the blowhole. Hand harpoons dating as far back as 10,000 B.C. indicate an even longer tradition of whaling in Japan. At the turn of the 20th century, Japanese coastal whaling received a boost with the introduction of steam ships and grenade-tipped harpoon guns. However, it wasn't until 1934 that Japan expanded its whaling to Antarctica. Whales helped keep Japanese citizens fed both during and after World War 2. In 1947 whale meat made up almost half of all animal protein consumed by the country. Nearly 20 years later, whales continued to make up nearly one-quarter of the Japanese diet. This history is an important part of why the Japanese continue to hunt whales. Attempts to stop the nation's whaling are perceived by many as a threat to Japanese culture. According to its defenders, eating whale meat is an old and impenetrable Japanese tradition. "No one has the right to criticize the food culture of another people," said Matayuki Komatsu of Japan's Fisheries Agency. A sense of pride also fuels Japan's commitment to whaling. 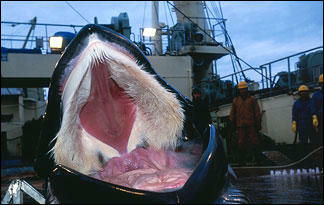 To some, the words and actions of those who oppose Japanese whaling are "culturally arrogant" and unnecessarily harsh. This only serves to strengthen the country's resolve to maintain its whaling, according to some. Minke whales, though not at historic levels, remain plentiful. A population of 761,000 exists in the Southern Ocean, according to Japan, though some claim the number is closer to 268,000. Regardless, they exist in enough numbers that a return to commercial whaling of this species can likely be supported, assuming strict management of stocks and reasonable annual catch limits. Japan says that its whaling research over the last two decades has paved the way for long-term, sustainable use of this "renewable marine food resource." Why not hunt whales if they can be hunted sustainably? And if the principle of sustainable use is compromised on behalf of one animal, what's to stop a "domino effect" from happening that in time would limit Japan's use of other animal resources that it relies so heavily upon?